Starting off with a happy card today. Supplies: Card Blank Ivory 61/2" X 5" Value Pack Hobby Lobby, patterened paper-My Mind's Eye MMEBK1, Ink: Ranger Archival Ink-Sepia, CTMH markers-Sweet Leaf, Bamboo, Bubblegum, LePlume II marker-pale orange, Stamps: My Sentiments Exactly MSE! Q704, Scrappy Cat SCR509 Birthday Wishes, Starform Outline Stickers-gold, Bubbles and Bling stickers. 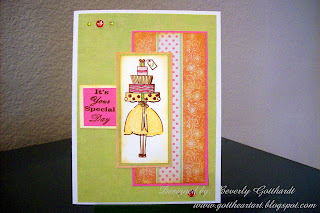 Great card.Your image is so adorable, and your colour scheme is perfect. Thanks for joining in the fun at Sunday Sketch & Stamp.